Sometimes when I see pretty photos on food blogs, I also picture the blogger puttering around her Pinterest farmhouse kitchen wearing something like this. Do you get the impression that a blogger has it all together just because she has an organized site with beautiful pictures and informative posts? I’m willing to bet that there’s a mountain of laundry and piles of clutter around her house. Maybe she didn’t shower until 3PM (or at all). Or she most likely had to clean up more than one type of bodily fluid before breakfast. 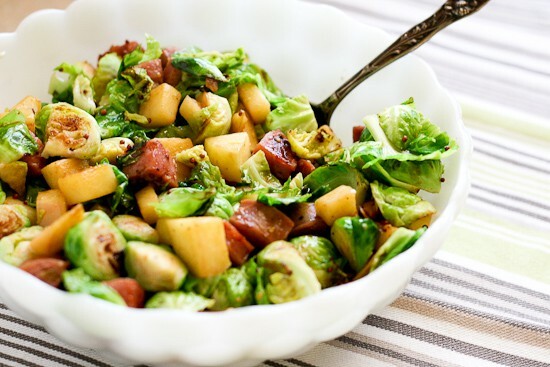 Trim the Brussels sprouts and slice them in half. If they’re big, then quarter them like the ones above. Oh, wait. You can’t see those. Nevermind. 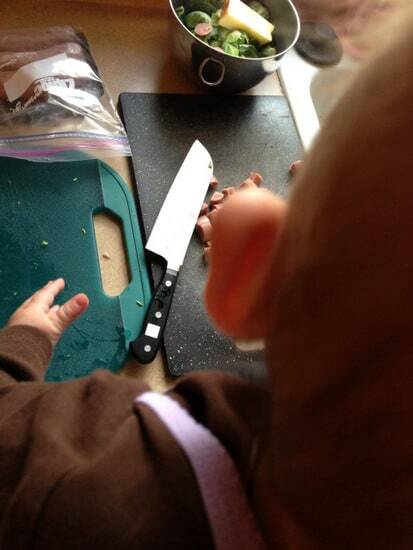 Remember to stand as far away as you can from the counter so your baby doesn’t kick the handle of your knife. Wouldn’t want to lose a finger today. Chop the apple. And be alert for sudden flailing arms and legs. Babies get excited about fruit. Do the same with the sausage. As you glance into your dirty sink, make a promise to yourself that THIS will be the night you clean it. 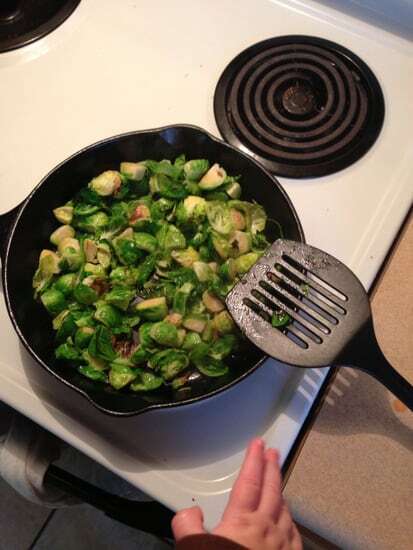 Melt the butter in a skillet and add the sprouts. Cook them until they begin to caramelize slightly. Remove them before they cook too long. Add the remaining butter, apples, and sausage to the pan. Wipe up any drool or spit-up that may have dripped on your forearms or jeans up until now. 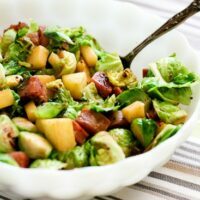 When the apples have softened a bit and the sausage is cooked through, add the sprouts back to the pan. Try not to think about the good old days when you had a gas stove. And four working burners. Go over to the only square foot of counter space with good lighting. Try to keep your baby from bumping and drooling on your reflector board as you hold your heavy camera (and shoot) with the other hand. Remind yourself (for the 287,559th time) that you need to get some clips to hold your board up. Run your pictures through Lightroom (aka, the “Magicroom”) and they don’t look half bad. The truth is…. I love blogging. I love cooking. I love photographing food. I love meeting and interacting with all of you! And I’ve come to realize that we put our time (and money) into things that are important to us. I’m a bit of a control freak, so my blog feels like an organized haven where I have control over everything that happens and how everything looks. It’s also my creative outlet, which I desperately need as a full-time mom. And to me, having a creative outlet is more important than keeping my kitchen floor perfectly mopped. Or every piece of clutter picked up. But not more important than spending time playing with my kids every day. It’s a tricky balance sometimes. And 99% of the time I feel like I do NOT have it all together. I’m OK with that. 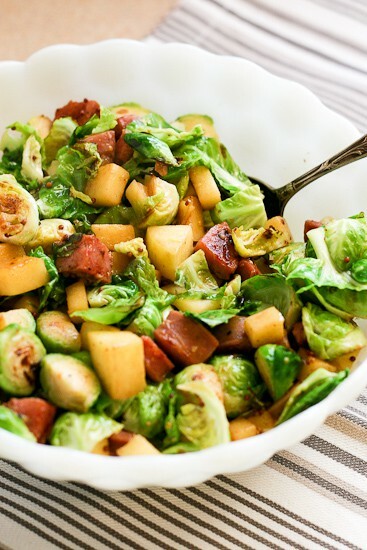 If you need a quick dinner on a weeknight, this Brussels Sprout and Sausage Hash with Apples will feed your hungry tribe in a jiffy. 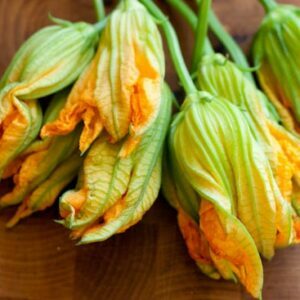 Trim ends off of the Brussels and discard them with any wilted-looking leaves. 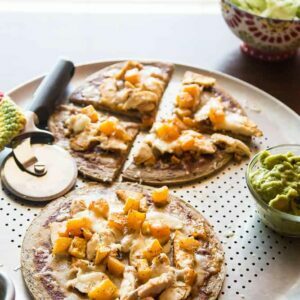 Slice them in half, and quarter them if they're particularly large, to make similarly-sized pieces. 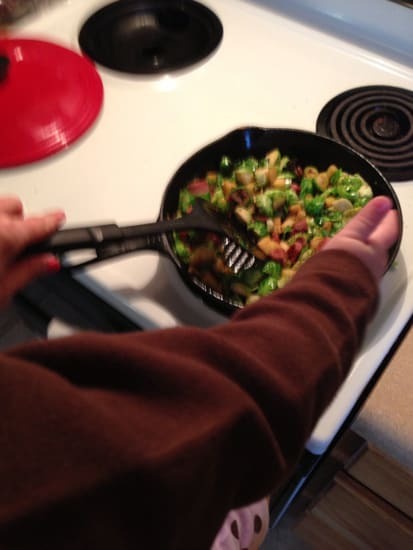 Melt 1 Tablespoon of oil in a medium skillet over medium heat. 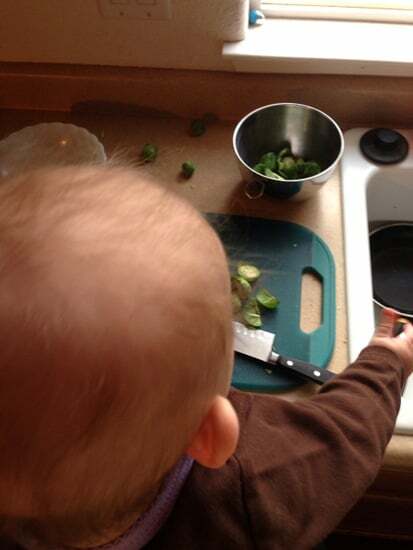 Make sure the pan is really hot before putting in the sprouts (you'll want them to brown before they cook too much). Cook them for about 5 minutes. Toss them around every so often until you start to see dark, caramelized spots. Transfer them to a bowl. 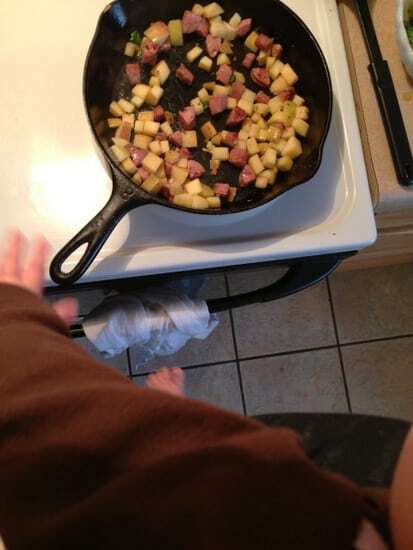 Add the other Tablespoon of oil to the skillet with the chopped apple and sausage. Cook for about 4-5 minutes until the apples begin to soften slightly and the sausage is heated through and has a few dark spots. Add the mustard and the vinegar to the skillet; stir to combine. Add the sprouts back to the skillet and cook for another minute or so. Season to taste with a pinch or two of salt and pepper. Yes! Dinner on the table is sometimes my only accomplishment during the day. Love this!! I feel like this too. People tell me all the time too, they don’t know how I blog and cook and have 3 small children, etc. But you’re right, it’s practically my only creative outlet! 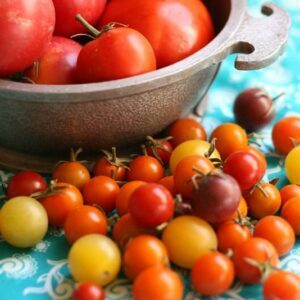 You do a great job Natalie, I love reading your blog. First, I love this recipe. And second, the post – amazing! 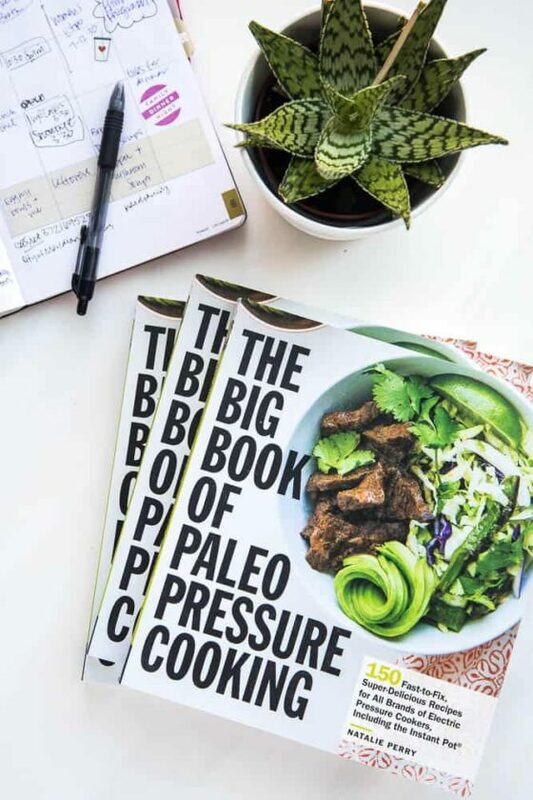 I love seeing inside other bloggers’ lives. 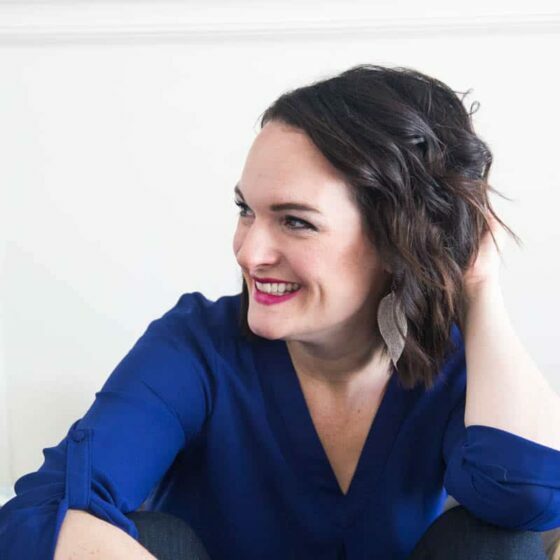 I love your blog, Natalie! Mostest awesomest blog post ever! Now that’s what I call dedication! ;) I can get up at 5 in the morning to work-out so that my evenings can be free to take care of blog stuff like cooking, taking pictures, writing etc. I can sacrifice most my week-ends to the same activities… But I could never do what you are doing here. Oh my! This commands respect! I can’t believe that you managed to get such beautiful shots, too! And your dish looks truly delicious. Thank you so much for opening your kitchen and sharing this little snippet of your life with us Natalie. You totally rock! Thank you Sonia! I must admit, though… I don’t know what it would be like to blog without kids. My oldest was about 9 months old when I started Perry’s Plate! I could definitely say the same about you… getting up at 5AM to work out. That’s something I couldn’t get myself to do, even when I wasn’t waking up with a baby 2-3 times a night. (I count doing 15 push-ups before my shower a work out.) Thank you so much for the encouragement and kind words! appreciate your honesty and the peek into your life!! 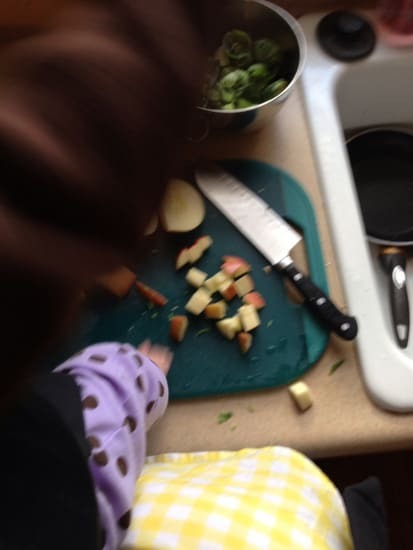 This post makes me laugh…because I can relate to cooking with little ones all over and into everything. My kids’ favorite thing was to get into the flour bin while my back was turned! Love it! Oh my gosh, thank you so much for this post! I totally imagine some of the blogging ladies doing the same thing in their beautiful kitchens with their Mad Men dresses….meanwhile I’m climbing on counter tops and attempting to make things at certain times of the day just to get any light at all. Your photos are beautiful, you’re doing a great job. It’s inspiring to know you are just a regular lady too! Yep. Totally relate. I always look at how serene food pictures look and then I feel like you should be able to hear a screaming two year old, just out of frame, trying to grab the biscuit before I take the shot. Most of the time she is sitting in my lap as I shoot saying, “Food! Cheeeeeese!” as she tells the muffins to say Cheese for the shot. I loved this post! Hilarious. I have small kids but no longer attached to me, so the idea of prepping and photographing the dish with child attached…blows my mind! Thanks Carolyn! I really don’t know any different, though! My oldest was 9 months old when I started. Blogging without itty bitty ones seems like a vacation to me! Love this post! Thank you for showing us the real deal and how to be ok with it! 1. You are amazingly talented with a little on on your chest! LOL! I love this post. Seriously couldn’t love it more. 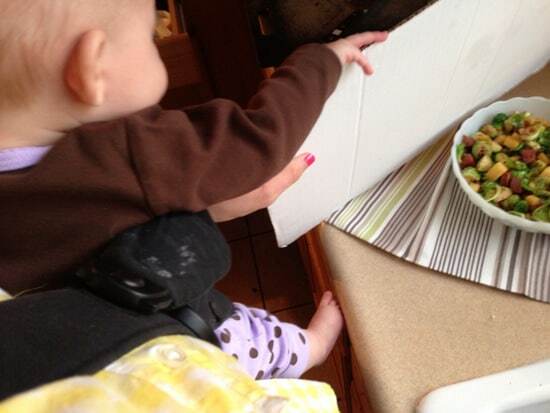 I cooked a few meals with my daughter strapped in the carrier and it killed my back because I’d stand in the most wacko positions. But dinner got made and the blog was born. So I guess it was worth it! This hash looks fantastic!